Horbury Facades, part of the Rotherham based Horbury Group, has secured a contract with Sir Robert McAlpine worth £4m to deliver a "through-wall" solution on a new multi-occupancy residential development in Manchester. 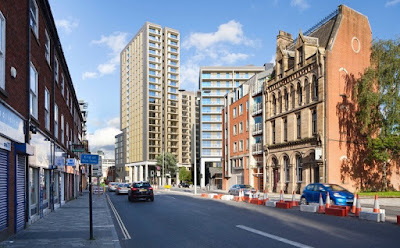 Forming part of the £80m regeneration of Salford's Chapel Street area, the scheme on Gore Street, Manchester, consists of 375 private rent homes, including 364 apartments and 11 townhouses, split across three blocks that range between 22 and 13 storeys in height. Working in collaboration with OMI Architects and SRM project delivery team, Horbury Facades is installing a complex horizontal plank rainscreen system, featuring multi-coloured aluminium panels incorporating complex balcony penetration details on the three residential blocks. Horbury Facades is also installing an SFS substrate utilizing an EOS framing system and non-combustible Siniat weather defence board. The scheme is set to be completed by 2020. Adrian Storey, general manager at Horbury Facades, said: "We are very excited to have secured the contract to work on the innovative redevelopment of Gore Street, we have extensive experience in delivering external envelope schemes and look forward to working with the team to bring their ideas to life to create vibrant new buildings." From its headquarters in the Moorgate area, the Horbury Group combines a number of subsidiaries that specialise in areas including joinery, ceilings, dry lining and health and safety training. Another subsidiary, Horbury Property Services, has been appointed by Carlisle-based Castles & Coasts Housing Association to provide fire safety services across its housing portfolio. The contract will see Horbury Property Services providing fire door and fire compartmentation remedials followed detailed fire risk assessments. Horbury Property Services will be working across 250 different residential schemes on behalf of the housing association, including apartments and houses, as well as supported and sheltered accommodation. Richard Sutton, general manager at Horbury Property Services, said: "This is the latest in a number of fire safety contract wins with social housing providers. As FIRAS-approved contractors we have the experience and skills to be able to deliver fire safety works to the highest standards to ensure compliance to the regulations."